December 31, 1975. The segment from the headwaters of the main stem to the national forest boundary. The segment of the West Fork from the wilderness boundary downstream to the confluence with the main stem. Wild — 26.8 miles; Total — 26.8 miles. The water quality of Rapid River is exceptional; the river contains three listed fish species, chinook salmon, steelhead and bull trout, and associated critical habitat. 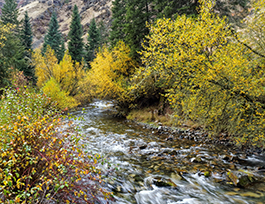 The river's scenery is also outstanding; the steep gradient and narrow canyon focus the viewer's perspective on the fast-moving water and diverse riparian vegetation.